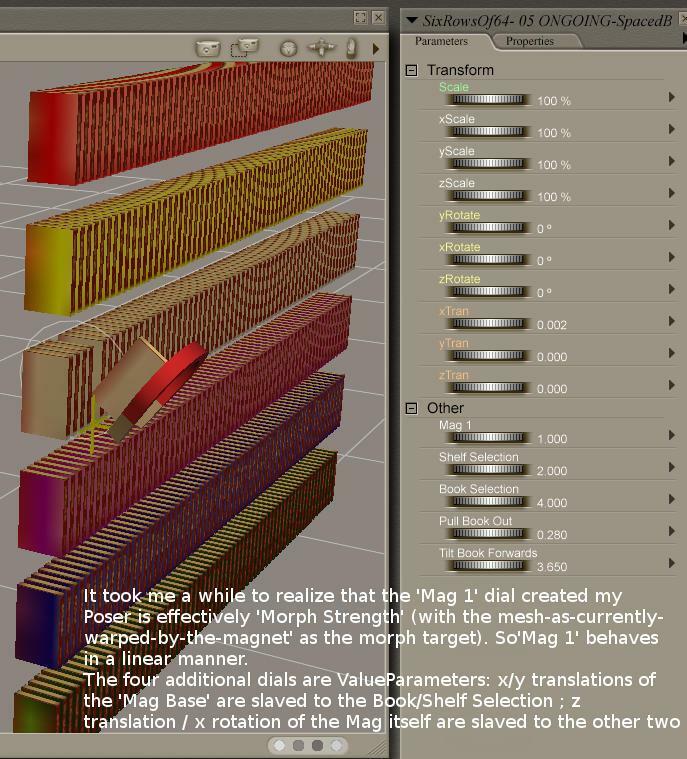 Mon 27 Aug 2018: Two morph targets to make the bookrow a more realistic stack of books uploaded to this post below.You need to download the two TXT files attached to that post, rename them as OBJ files, and then in Poser/DS apply them to your prop as a morph target. 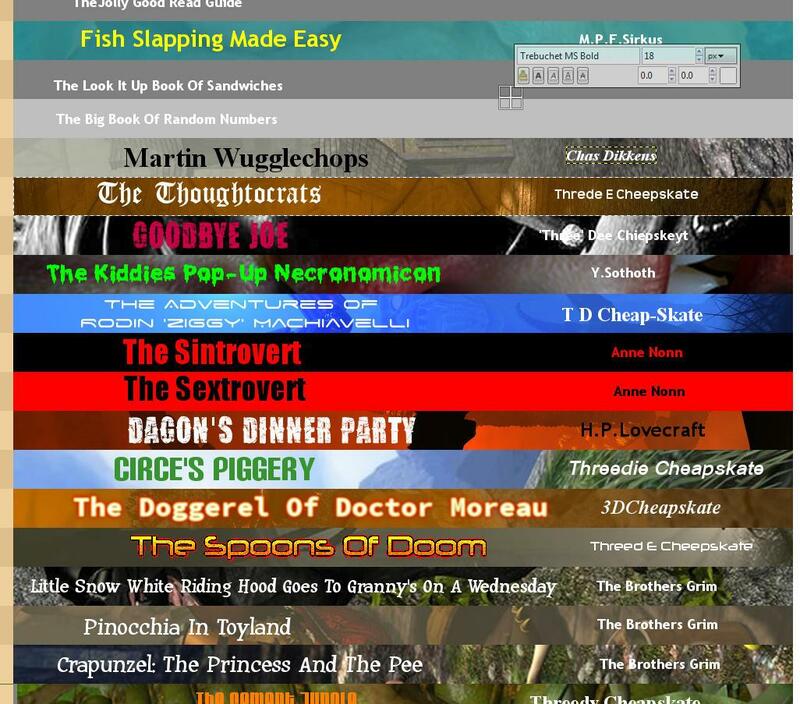 Mon 27 Aug 2018: With luck mCasual will be posting a script for creating random blocks of books and a morphing book prop as mentioned in this post below. Mon 29 Oct 2018: ​3DCheapskate's Six-Bookrows Prop is now uploaded at ShareCG. Also see this post on page 2 of this thread. 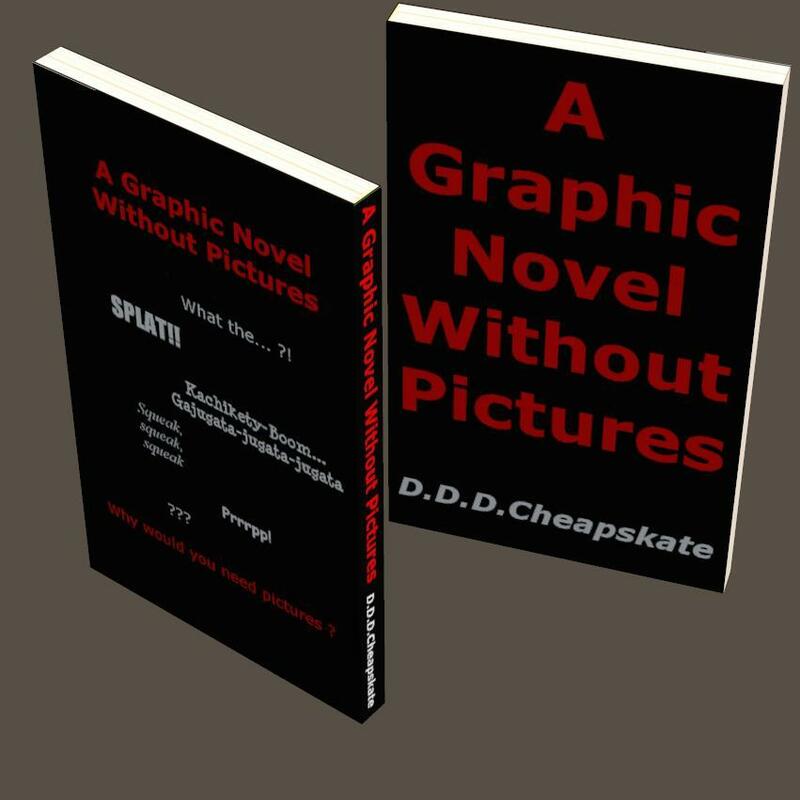 Mon 14 Jan 2019: "More Of The Cheapskates Books" now uploaded. See this post on page 2 of this thread. 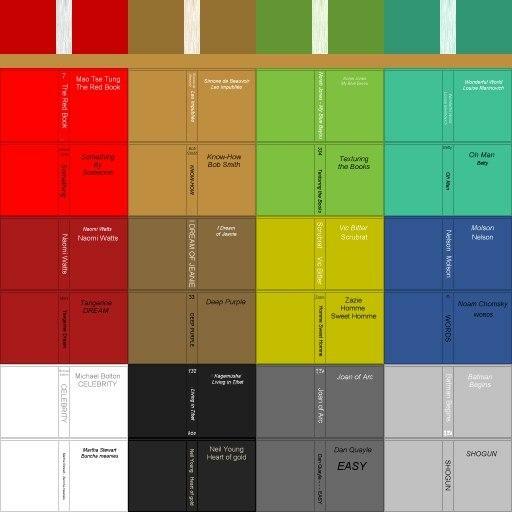 Geometry-swapping multi-bookrow figure to easily change one row of books for, say, a stack of atlases. It's not quite ready yet, but I've done a first 2048x2048 texture JPG for testing. Yes, the books are duplicated - I said it's a test! Since I tend to lose stuff that's on my PC I'm posting the JPG here for starters. I'll post again as and when I make progress. 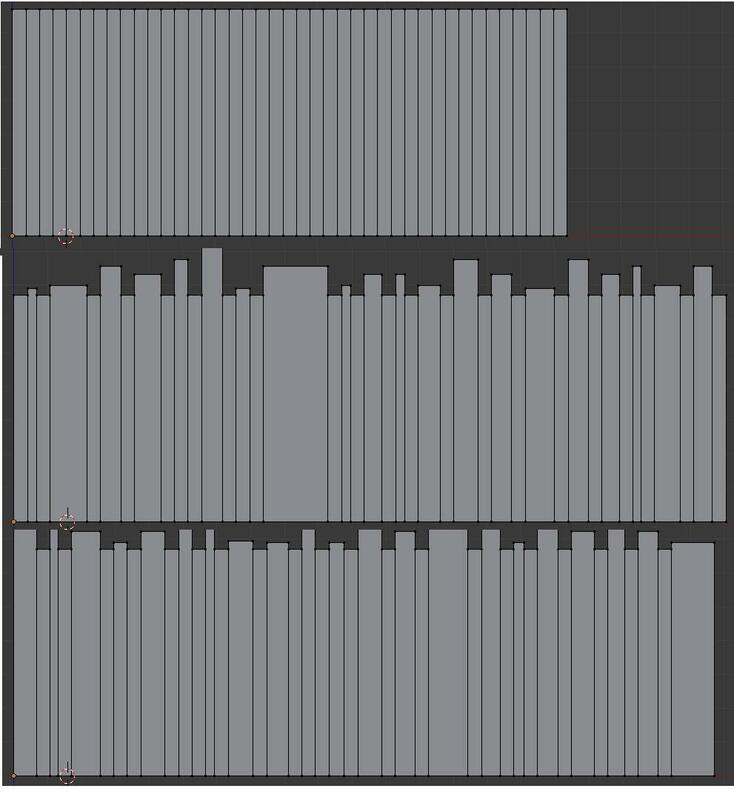 Edit2: With a few vertices and faces for each book (6v/2f for just spine and top, 8v/4f for spine+top+covers, up to 8v/6f for all six sides) there's a lot more flexibility.41 books of different sizes using about 287 vertices/123faces. Still using just the attached JPG for texture. You can probably tell that the covers aresimply UV-mapped to a small section of the spine.The intention was to grab a similar colour swatch - but of course there's sometimes text too. Edit3: A couple of simple morphs for each book ('bigger','thicker', and 'lean') would add to the fun. 'Bigger' only affects that book. 'Thicker' and 'Lean' require all books to the right to be moved too. 'Lean' won't combine nicely with the other two.Also with 41 books in the prop, theorganisation of the morphs on the UI needs a bit of thought. Maybe a 'Gap' morph would be better than a 'Lean'? A single book prop,leaning, could then be put in the gap. I'm expecting to do normal/bump (and maybe displacement, for micropolygon-displacement renderers 3Delight and Firefly) maps when I get around to doing hardbacks. Maybe need them for well-readpaperbacks too? I should have mentioned what my aim is (or perhaps in 'asset-speak' - I should have 'stated my mission goal'... ). 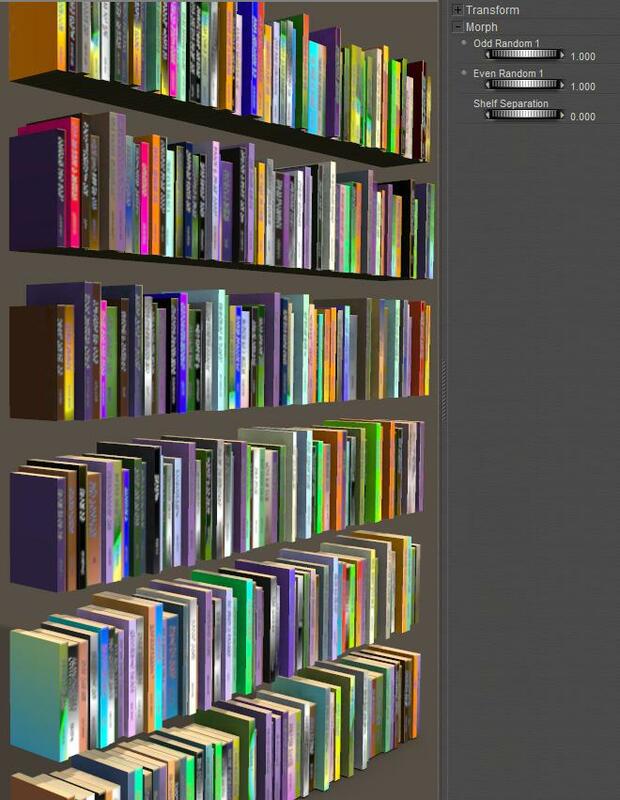 "I just want a quick and easy way to populate all my empty virtual bookshelves with a visually interesting library"
Doing individual morphs for each book (as mentioned in edits to theOP) would be heading off in totally the wrong direction. I'm not interested in fine-tuning the size of any book.I just want a random-looking collection of different sized books. So a couple of morphs for predefined randomish booksizes should fit the bill there. I also like the idea of being able to add a small gap between books. 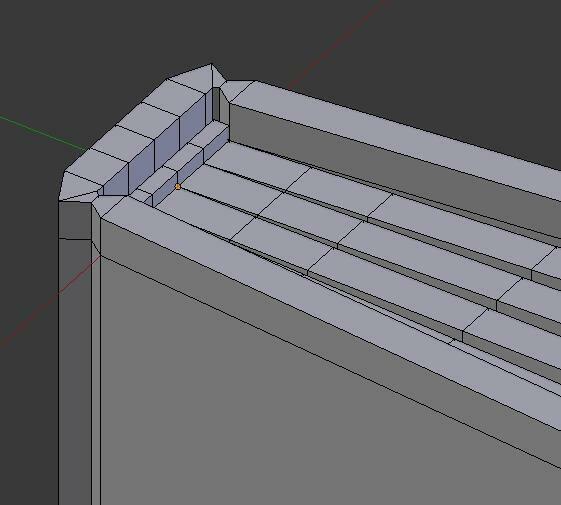 Adjusting the thickness of books and adding gaps between them allows the bookrow's length (or width depending on your preferred terminology) to be adjusted in an interesting manner. I think that looks quite visually interesting and flexible- not bad for a 328 vertex / 246 face row of books with a single 2048x2048 JPG texture. I had been worried about the titles on the spines being stretched too much when I made a book thicker. But I was forgetting that these books are mainly to provide background clutter and visual interest. Being able to read the titles isn't important. And I'm beginning to get bored with this already*. Maybe I should release what I've got so far ? Edit: maybe another morph, 'A4 Size', could be useful ? Everybody knows A4 size** - its, errr... [quick Google]... 21cm × 29.7cm (note to self: 1 PNU = 103.2" or 262.128021cm). The base mesh at the moment is roughly standardish paperback size - 17½cm × 10½cm × 1cm (it's a thin paperback), but I'm wondering whether some arbitrary base size and a 'Standardish Paperback Size' morph would be better. You see the sort of quagmire of insignificant irrelevances (irrelevancies?) I get entrenched in ? And entrenching in a quagmire is really no joke ! 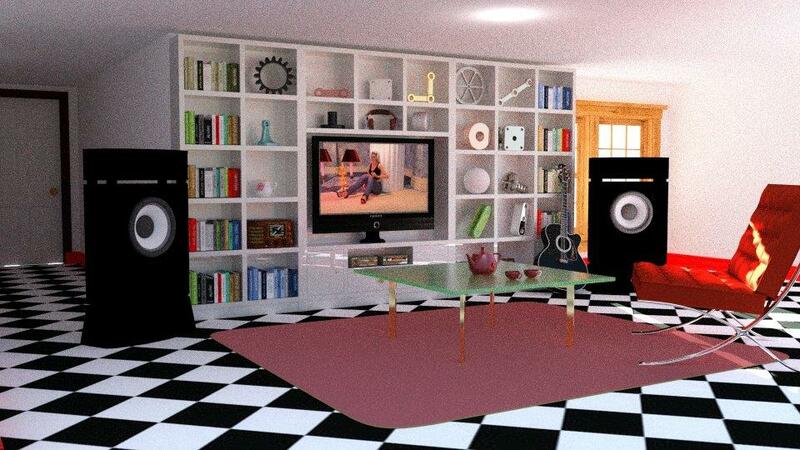 "A first test of a simple prop for populating all those empty virtual bookshelves. Hopefully I packaged everything up that's needed. It'seems a long time since I last did one of these.."
Hope you all find them useful ! I'm still working on further versions of this, including one with six rows of books and poses/morphs to fit them to all the bookshelves that I have in my content library. Also playing with a figure version that will use the old-school Poser geometry switching to swap rows of paperbacks for stacked atlases, sundry knick-knacks, etc. Although I'm probably going to be side-tracked till the end of the month. In the meantime, for anybody who wants to do their own textures I've added a couple of template/helper images to the ShareCG download page - not the ZIP (you don't need to download that again! ),just extra images on the download page. I'm playing with the six-rows-in-one prop for filling a whole bookshelf in one go. 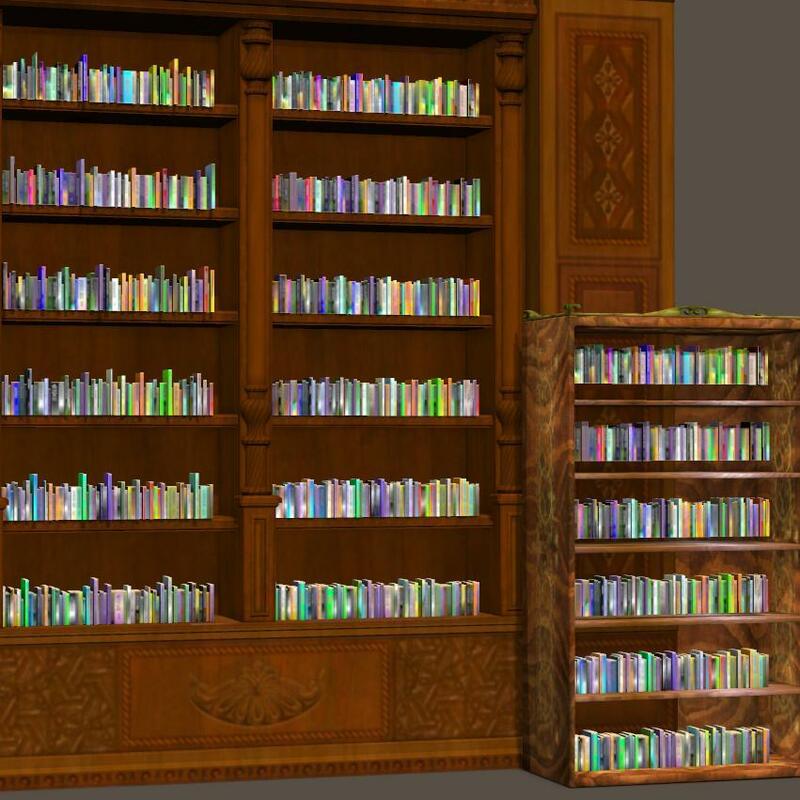 I've had a little bit of a rethink on the UV mapping, and I now have a single prop containing 364 books (6 rows, each with 64 books). 3072 vertices / 2304 faces in total (i.e 8 vertices / 6 faces per book). And it's all mapped onto a single 2048x2048 JPG. At the other end of the scale I'm playing with a single 8 vertex/ 6 face book with all six sides properly mapped. The varying dimensions of books and magazines mean that separate props might be the best way to do single standard paperbacks, thick paperbacks, magazines, etc. 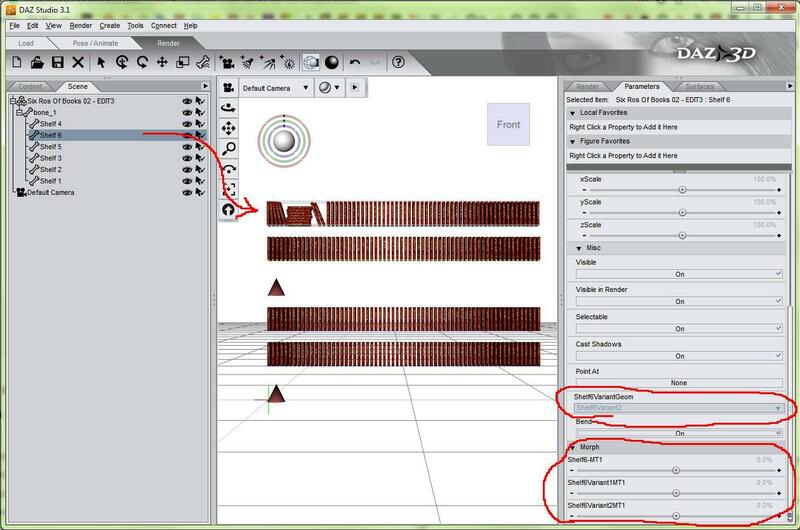 Or perhaps morphs plus alternative UVs - but afaik that can't really be done in Poser, although DS is fine I think? The basic idea for the six rows works - here they are in the bookcase from The Study (here in the DAZ Store) and in seachnasaigh's bookcase (FW2009) freebie from ShareCG. Just the three dials shown in the previous post (plus X,Y,Z, translation) used to put the booksinthe shelves. The small paperbacks look a bit out of place in the study's bookcase - a size morph (like the 'A4 Size' one in the original book row) would probably help. A more classy selection of books would probably also help - so that'd be a new texture. 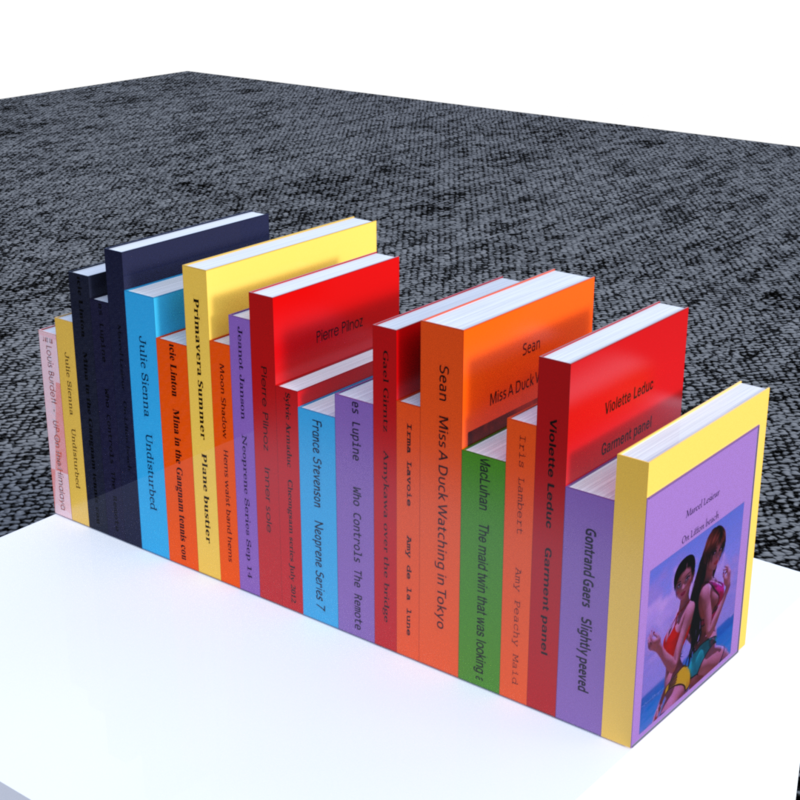 Also the book rows don't fill the shelf width,although I could adjust them to do so using the standard 'X Scale' dial. 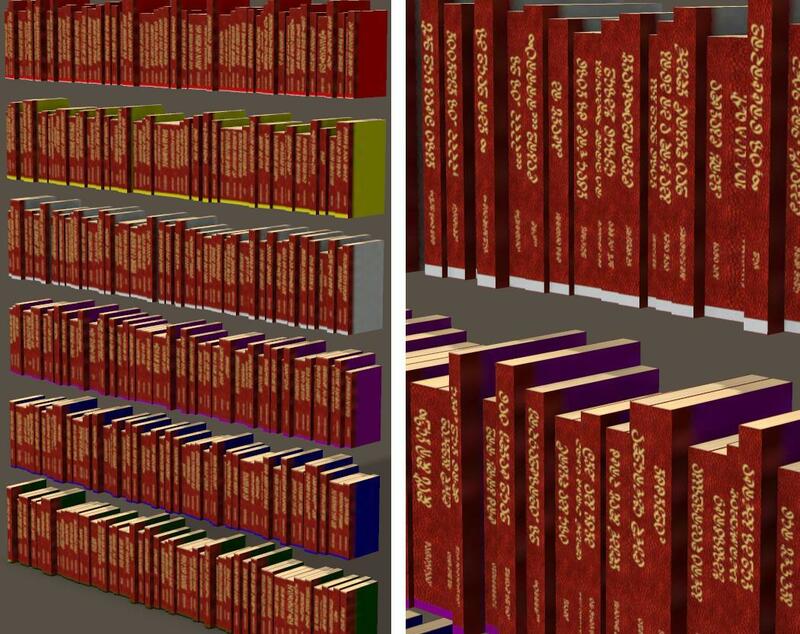 I realized that the 'Random' morphs in the original book row prop change the overall width of the book row, but in this new six row version they don't. Not sure which is preferable. Several things to think about on this (suggestions welcome!) - off to bed now. I think that it looks quite convincing with the uneven rows & sizes. Good work! Real books, as opposed to paperback books have a curved spine. Yep, that's the effect I was trying to get using bump and displacement. But it's actually the sort of gutter between the spine and the coverboard that seems to be the distinguishing feature of hardbacks. Just looking at the few hardbacks I have to hand, they all have this gutter, but about half of them have completely flat spines. That surprised me as I'd always assumed that hardback spines were always curved. It seems to depend on the method of binding method used, and there are several different ones even in my meagre collection. Edit2: And don't forget that hardbacks (as opposed to leatherbacks... ?!) often have dust-jackets. 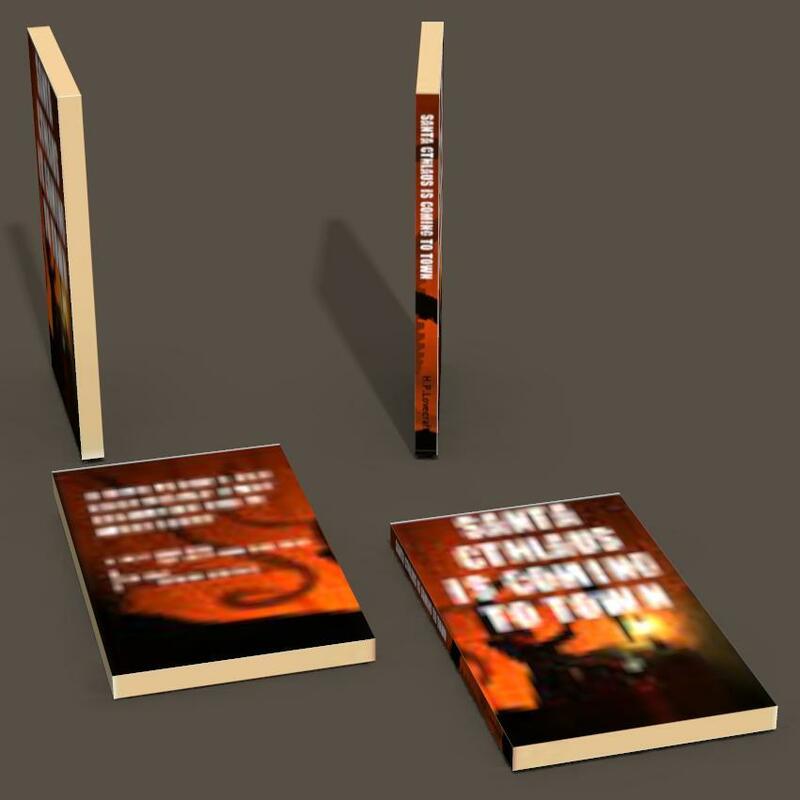 So when you open a hardback in real life,as well as the spine behaving in one of several different ways (and the pages too), you also have the behaviour of the dust jacket to consider ! I'm planning on incorporating all of this into some open (possibly figure) books. Honest ! 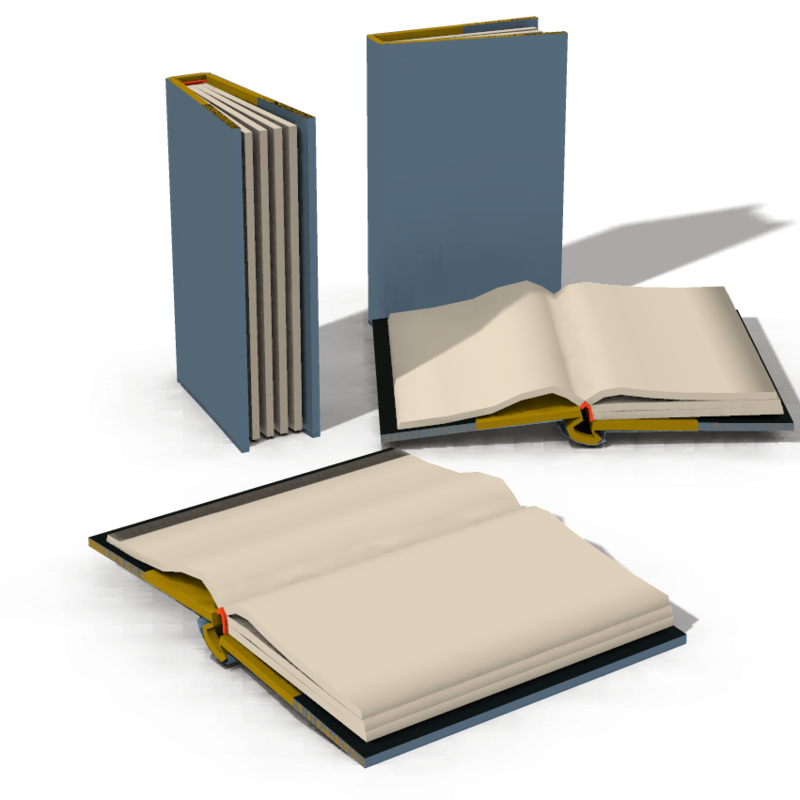 Edit: Just playing with the very simple 8vertex/6face book mappings,and this simple render made me recall that the black covers shouldbe glossy, but the white/beige pages should be matt. I think a simple mask is going to be the easiest solution for that. They only increase the height and width (cover width that is, not spine width - 'thickness' seems a more logical term for 'spine width') of every odd/even book. Maybe some books should be left at the same height, and some should be made smaller. I could use a simple black/white (PNG) mask to make specific books invisible. 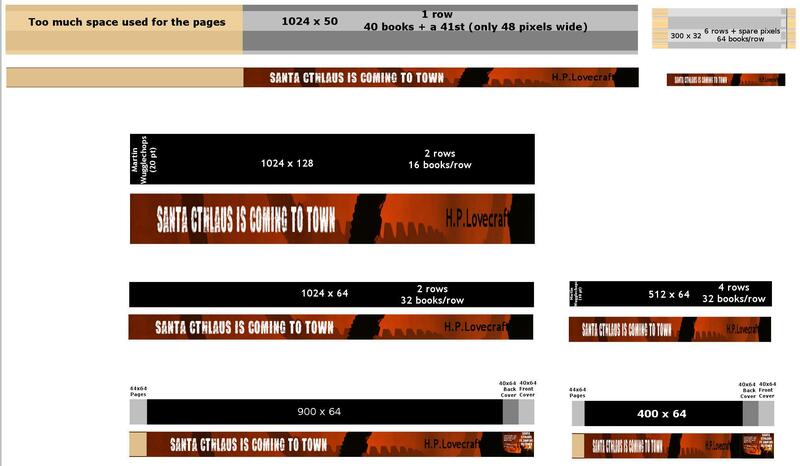 Mainly thinking of using this to make the row shorter, say 20 books, 30 books. But since there's no gap between books, any inaccuracy or blur of the black/white boundary of the mask (whether in the image or in the Poser/DSprocessing) will mess this up. INPUT / FEEDBACK / IDEAS /OBSERVATIONS / SUGGESTIONS are very welcome ! Don't be shy ! And I see it's already stocked with books - is there perhaps an mcjBooks too? Edit: Of course the pages willneed to bend, and probably the spine too since some hardbooks do have curved spines. I've already made the height of the spine and coverboards slightly greater than that of the pages, and I've added a raised bit for that two-tone stitching at the spine end of the page tops. A nice dust-jacket would be fun too ! Once I've got the basic mesh sorted I can start playing with morphs (e.g. slightly open, open 90 degrees, open flat, etc) which would be of the 'should only be set to 1.0 (100%)' type. It'll probably need to become a figure too. 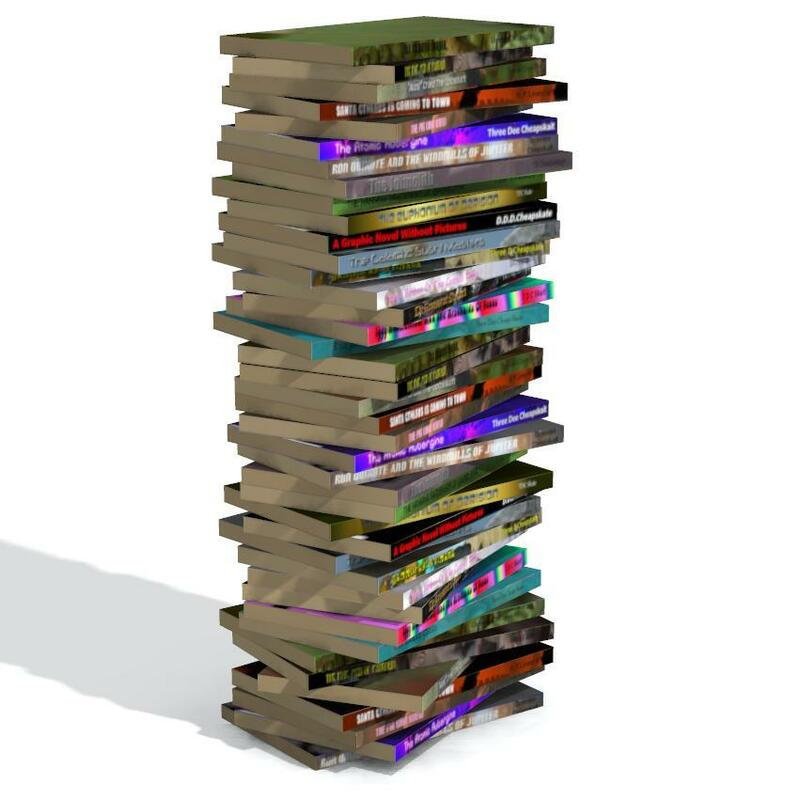 Over on the SM forum somehody posted a render where the bookrow was used as a stack of books. It looked odd with the bottom edges of all the books perfectly aligned, so I created a couple of simple morph targets to jiggle the books about a bit. Since they're rotations it's best to stick to morph values between 0.0 and 1.0 (0% and 100%) - if you use negative values or values greater than 1.0 (100%) the rotating books will start to grow and go out of shape. But this can sometimes create interesting* effects,so I wouldn't enforce the limits. I'm not adding/changing anything at ShareCG yet because there are several other things I want to incorporate in the next official version. So for now you can grab the MT files fromthis post and apply them for yourselves. Check that the two new morphs work. Because the books are so much bigger than default (due to the A4Size,OddsRandom1, and EvensRandom1 morphs being set rather high), it's necessary to use much larger values for these two new morphs to compensate. Try it for yourselves. It's fun. 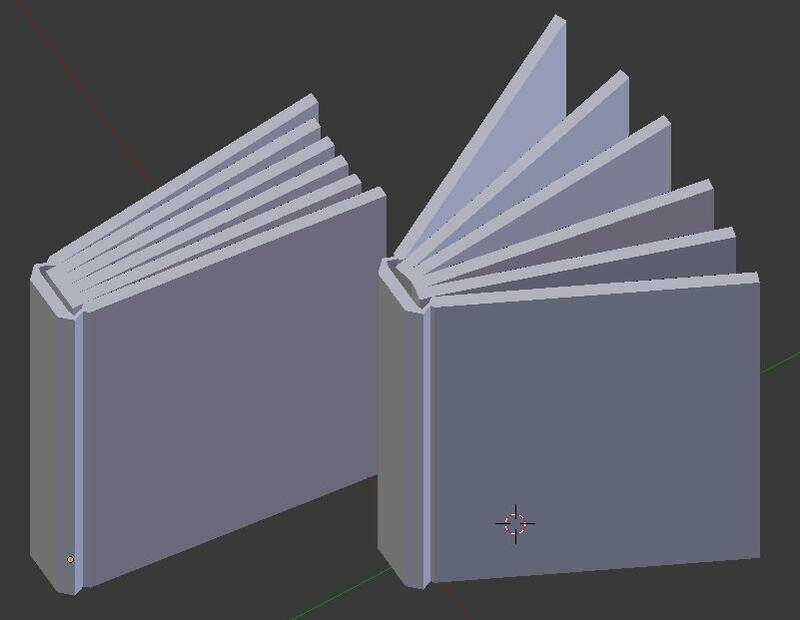 I've added a dust-jacket to the basic hardback mesh from a few posts earlier (it's now up to 274 vertices/ 254 faces) and had a little play to see if I can morph the mesh into an open hardbook that actually looks like a real open book (I'm specifically talking spine-wise there). And the extra vertical edges I added to the page-blocks to allow them to bend need a bit more thought. I don't think they're yet quite dense enough near the spine, which is where the main bending occurs. 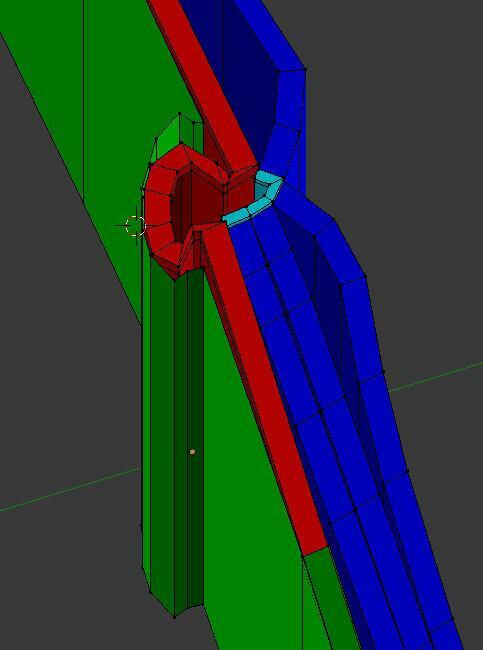 I'm still working with the goal of a minimal mesh so it's not just a simple case of adding in extra subdivision. I will need a few extra edges, but I think it's more a case of adjusting the ones I've got. 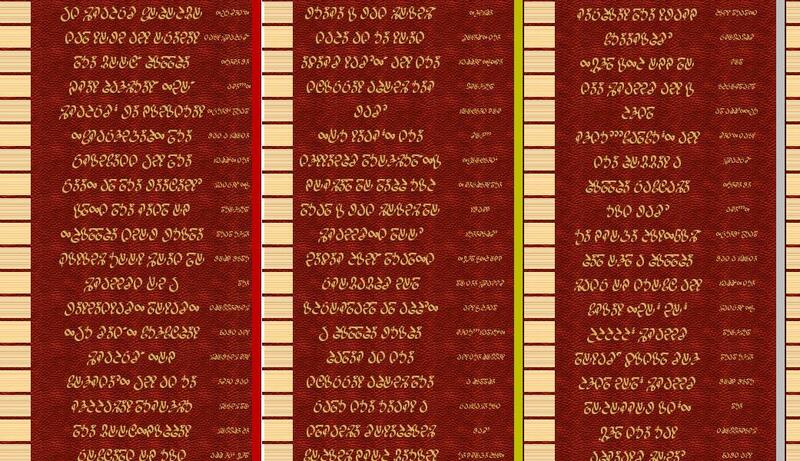 And it would be nice to have one of those thin ribbon bookmarks that classy hardbooks sometimes have sewn. But I haven't got any of those at hand, and I can't recal exactly where or how they're usually attached (and Google images aren't helping me with that) - could somebody who has such a book take a photo of the attachment and post it here ? 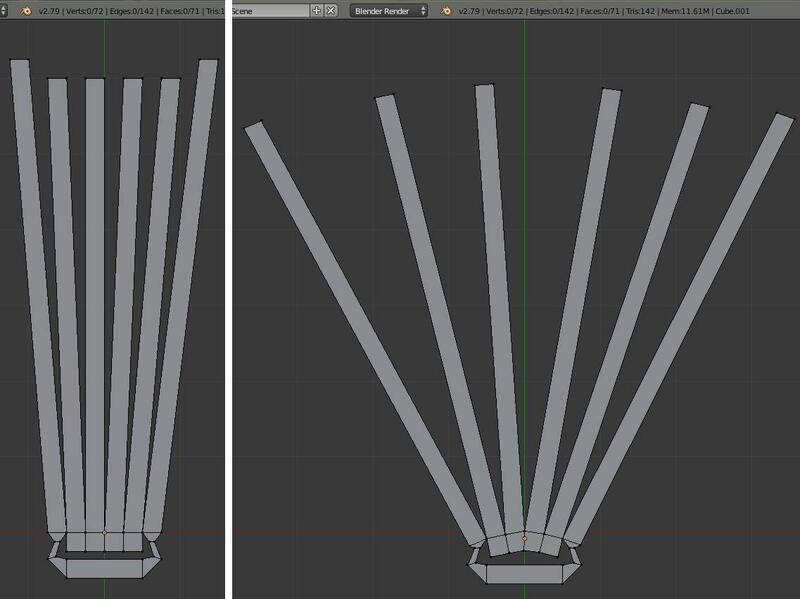 Just been rethinking the UV mapping. The attached image won't probably mean much to anybody as it's mainly for myself. 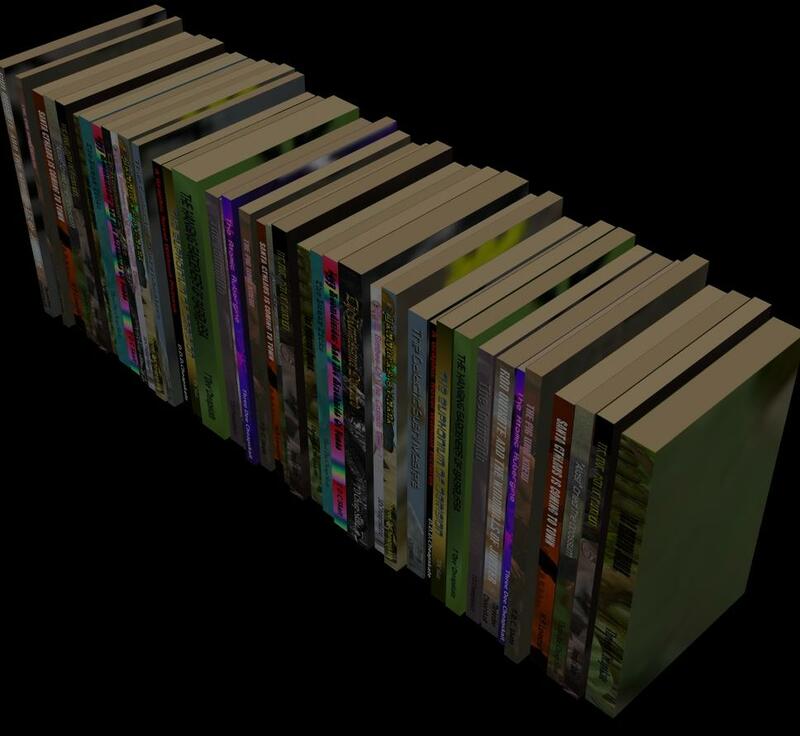 The top row (with the three-tone-greys) is a couple of book-spines with my original mapping (left) and a denser mapping for the six-rows version of the prop. 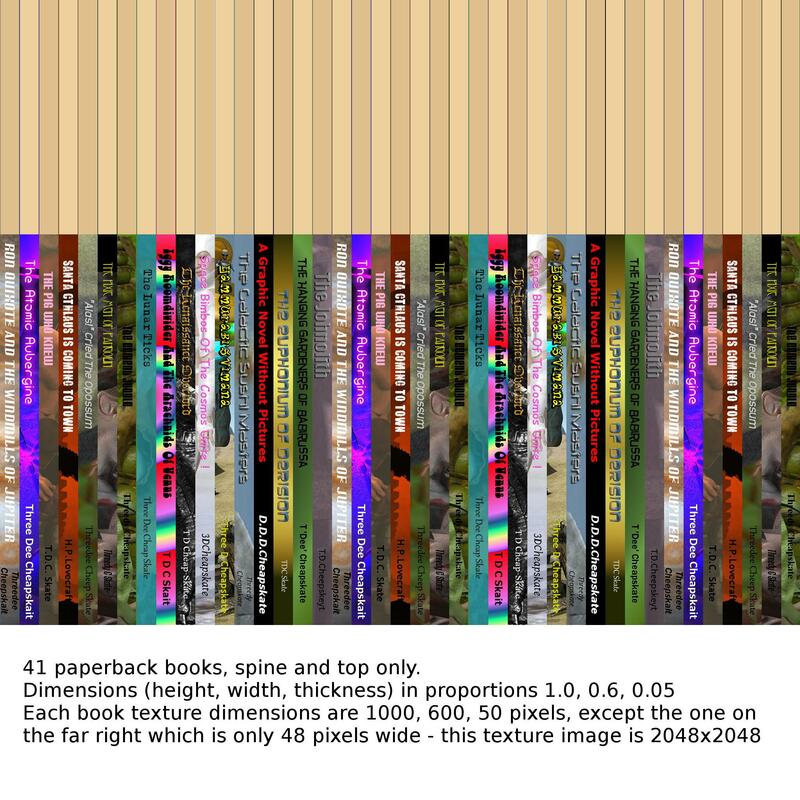 I then picked a few sizes of paperback-spine-ish proportions that would tile both vertically and horizontally on a 2048x2048 image and scaled one of book-spines to those sizes to see how they looked on the UV map. I also wondered about UV-mapping the front and back covers to separate areas (rather than just grabbing a bit of the spine texture), and was very surprised at how good a 40x64 cover looks. Of course I still need to see what such a mapping would look in a render. I'll probably end up just doing a single colour fill for the covers if I go this route. took me longer than i thought to make it usable by someone other than me but it's ready ! Glad you got it sorted ! *I know that's an old one, but I still love it - and I'll keep repeating it till I get bored with it ! I ran into some problems trying to avoid duplicating OBJ files for the geometry swapping thingy above...and then the apathy took over. Edit: I'm wondering whether "A.Nun" might be a better author for the two in the middle? And I'm also thinking that I should perhaps stick to paperback novels for this one - maybe save titles like "The Big Book Of...", "The Look It Up Book Of..." for a separate collection? LOL! I love the titles!